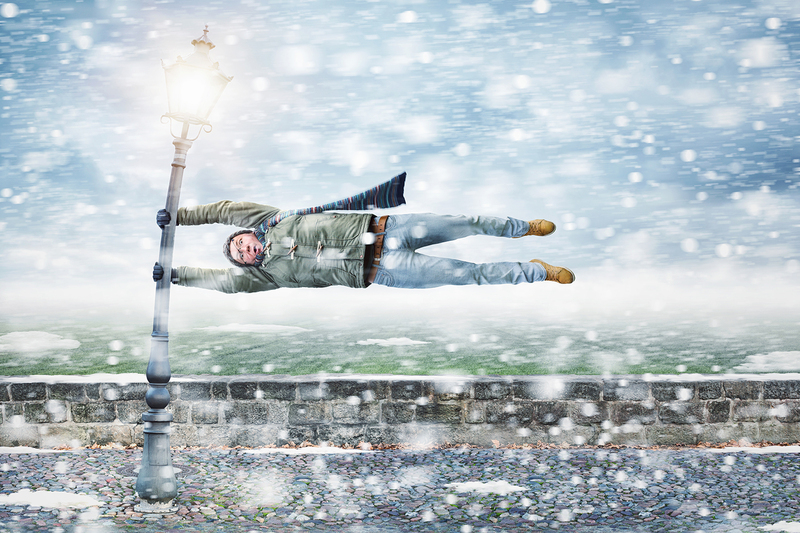 The combination of wind and low temperature in winter can be extremely dangerous. The wind chill index helps you determine when dangerous conditions develop that could lead to frostbite or hypothermia. It takes into account heat loss from the human body to its surroundings during cold and windy weather. The calculation utilizes wind speed in miles per hour and temperature in degrees Fahrenheit. 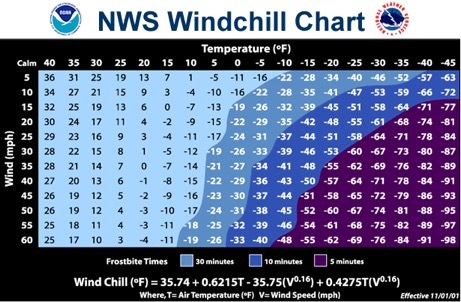 For example, a temperature of minus 5 degrees occurring with a 20 mph wind gives a wind chill near minus 30 degrees (see wind chill calculation table below). This means that your body will lose heat at the same rate as it would if the air temperature were minus 30 degrees with no wind. 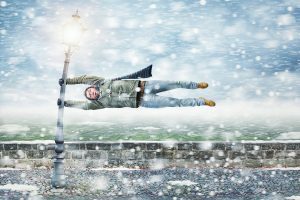 Wind chill values near minus 25 degrees mean that frostbite is possible within 15 minutes. Stay dry. Wet clothing results in much faster heat loss from your body. Take breaks in warm areas or vehicles as needed. Drink warm beverages to help warm up your core temperature. Stay informed. Utilize local weather forecasts, paying particular attention to the wind chill advisory, to guide you in dressing properly for the outdoors. On very cold days, minimize your exposure to the outdoors if possible.